Happy National Handwriting Day everyone! I can hear you now. Yawn. Zzzzzzzz. Boring! But wait (in that annoying infomercial voice), not everyone is as interested in handwriting as me, but what about if it affects your children’s learning abilities and your memory as you age? Maybe I have your attention now. Maybe not. Either way, today is National Handwriting Day and I’m all over it. Especially the lost art of cursive writing, which in my opinion is a shame. I distinctly remember the white on green cursive ABC letters that hung in my childhood classrooms and I treasure recipes I have of my mom’s written in her handwriting. Printing out a recipe off the computer just doesn’t have the same sentiment. 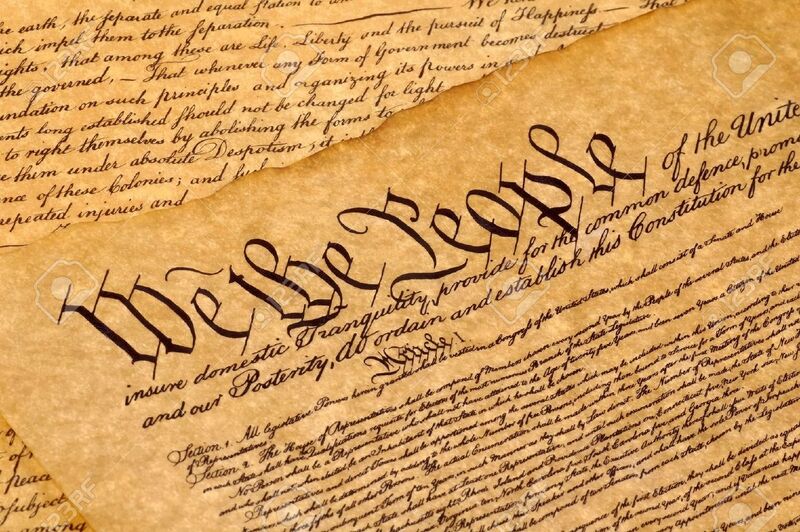 And what about historic documents like The Declaration of Independence? They just wouldn’t look the same typed out. On a more current note and considering all the personal data protection concerns we face, what about forgery? It is waaaay easier to forge a printed signature than a cursive one. Still, think about it: when was the last time you actually wrote something? I still write thank you notes. I still write out my grocery list. And, I’m handwriting all of my student assessments. I’d bet the house that most people email thank you’s, enter grocery lists on their phones, and print work materials off their computers. All this, even though putting pen to paper is proven to help kids learn to read and helps adults learn new concepts. 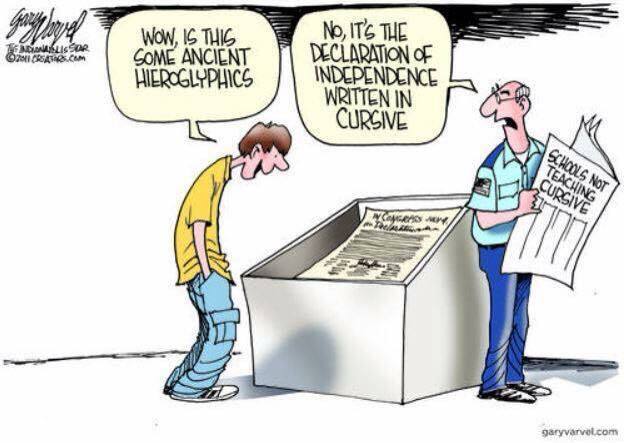 But, cursive is fast becoming a correspondence relic and what some consider a 21st century skill. 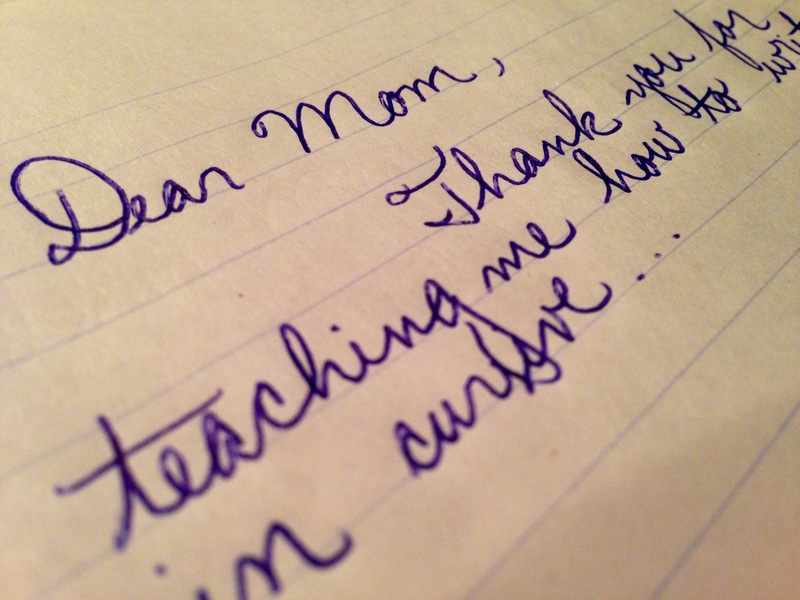 The writing may be on the wall for cursive, and it’s not pretty. Do we really want future generations to be unable to read our country’s historic documents? Remember shorthand? Well, cursive may not be far behind even though the physical act of writing helps students improve fine motor skills that help them get through life. It also develops letter recognition, which is a strong predictor of reading success. The spill-over between writing and reading is undeniable and yet it seems the keyboard is taking over. So is Common Core. Oh Common Core, the set of uniform (and controversial) educational standards that have been adopted in most states and that do not support the teaching of legible writing after first grade. After that, it’s all about keyboard proficiency. It’s an effort to improve America’s schools, but not everyone is on board the keyboard only trend. Psychologists and neurologists alike warn educators that learning cursive is an important tool for cognitive development and that it is way too early to eliminate handwriting curriculum. A New York Times article reported that children read better when they learn to write by hand and that writing also makes them better at generating ideas and retaining information. Apparently the brain likes handwriting so what’s not to love? A study at Indiana University proved this by showing a letter to children who had not yet learned to read or write and asked them to draw or write it down. They could either trace the letter, write it freehand, or type it on a computer. While doing so they were placed in a brain scanner, which showed that those who wrote freehand exhibited increased activity in three key areas of the brain while those who typed or traced the letter showed no similar brain effect. In short, when they wrote the letters they used brain regions known to help reading skills but they did not use these areas when they typed or traced the letters. Mic drop. The brain is also affected by handwriting in that seeing a letter written in various forms is way more beneficial than seeing it the exact same way every time we read it, like on a computer despite the many font choices. No two letters are the same every time we see one and yet if all kids see are typed versions, their ability to distinguish variations diminishes. There is also a difference in how the brain relates to cursive and printing and the distinctions are leading some researchers to believe it may even lead to a potential treatment for dyslexia. In alexia, or impaired reading, some people who are unable to process printing can read cursive and vice versa. In addition, students with difficulty reading may develop difficulty with writing, part of what’s known as dysgraphia. Everyone focuses on dyslexia, but alexia and dysgraphia should be equally researched and developed. So much is being discovered, that a whole new field of research called “Haptics,” in which the interactions of touch, hand movements, and brain function are studied. And it’s not just school-aged children who benefit from handwriting and who may be in jeopardy if it’s eliminated. A UCLA study showed that college students learn better when they take notes by hand rather than on a laptop and other research showed that writing by hand allows a student to actually reflect on what is being taught, which in the end helps them better understand the lesson as a whole. In adults, memory and learning abilities are greatly enhanced with handwriting. Another benefit of handwriting something is ownership. Personal style and individuality results in a sort of “I did this” attitude and a proud, confidence-building moment. Everyone can type something in Helvetica but not everyone can artfully write and illustrate. In addition, writing is said to be something akin to playing an instrument and while not everyone has access to an instrument or can afford music lessons, everyone has access to pens and paper. Sounds like something “we the people” should be thinking long and hard about. Maybe cursive is the “write stuff” after all. I agree completely. 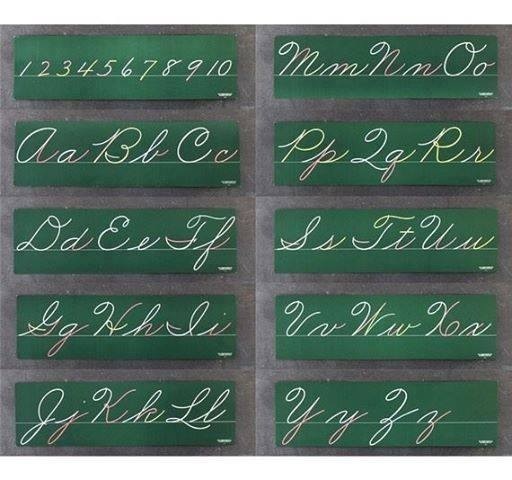 I loved learning and took a great deal of pride in cursive writing as a young girl. To this day people frequently compliment me on my penmanship.